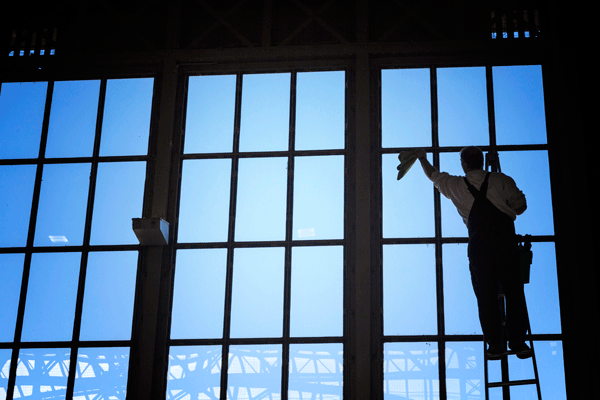 How Much Does it Cost to Hire Commercial Window Cleaners? Commercial window cleaning has an average cost between $5.50 and $14.46 per window. Companies that charge by the pane have an average cost between $2 and $8 per pane. Some companies charge a flat rate, averaging between $4 and $6 per window. For companies that charge by the hour, expect to pay between $36 and $58 per hour. The cost of window cleaning per pane depends on the size of the panes, number of panes, and whether the windows are being cleaned only on the outside or the inside as well. 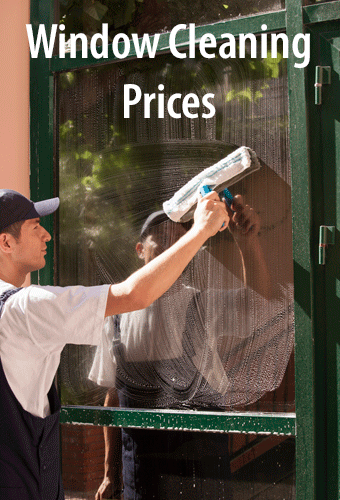 The cost of window cleaning by the pane averages between $2 and $8 per pane. Buildings with one or two stories have an average price between $3 and $6 per pane for outside washing only and between $4 and $8 per pane to wash the inside also. Smaller panes, such as French panes, may cost as little as $1 to $2 per pane. You can expect to pay more for windows with multiple panes, though some companies do offer discounted rates for larger buildings with multi-paned windows. The cost of window cleaning per window depends primarily on how many windows you have and the type of windows you have. Companies that charge by the window range in cost between $5.50 and $14.50 per window, but most average around $10 per window. It is important to note that companies that charge flat rates may change them depending on the amount of labor involved in the cleaning process. Some companies also offer discounts for higher numbers of windows. Paint or stain removal from windows has an average cost between $3.50 and $6 for regular-sized windows. If the cleaner does not include sills and tracks in their regular cleaning fees, expect to pay between $0.50 and $5 extra for the service. Second story window cleaning tends to have the same cost as first story window cleaning, but third and fourth floor cleaning has an average cost between $3 and $5 extra per window. Screen cleaning has an average cost between $0.50 and $5 per screen, but note that many companies do not clean damaged screens. Sliding glass door cleaning has an average cost between $2.50 and $8 per door. Though some companies include removing mineral deposits from windows, most charge for this service. The average cost is $20 per pane. Appearance: A professional commercial window cleaner ensures that your windows are as clean as possible. Not only does this improve the curbside appeal and outdoor appearance of your building, it lets in more natural light on the inside. Commercial cleaners help improve the appearance of your business both inside and out. Cost: It may not seem like hiring a commercial window cleaner is a cost-effective solution, but it is. Hiring a cleaner means you don't have to dedicate employee work time to window cleaning, which means that employees are free to focus on the job at hand. It also prevents the windows from being damaged in the cleaning process, saving you a fortune on repairs and replacements. Professional results: Window cleaning is more than just spraying some Windex and wiping it away. A commercial window cleaner has the experience to ensure that streaking, spotting, and flecking are not an issue. Safety: If you have a large or multi-story building, it simply is not safe to have an untrained, inexperienced person washing the windows. A professional service is licensed, insured, and staffed by experienced individuals. Many even have safety certifications from the International Window Cleaning Association (IWCA). Experience: This is almost a given, as few people want to hire any service that has little to no experience. You want a window cleaning company that has been in the game for a while, or at least employs people with plenty of experience. Flexibility: Every business, building, and window setup is different. The right company for you will work with you to customize cleaning plans and schedules that are tailored to your business and windows. If the company you are looking at does not offer flexibility in this way, it's time to start looking for a new window cleaner. Insurance: If your cleaning company does not have insurance, you could be liable for damages or injury to the worker. It is crucial that you choose a window cleaning service that has insurance that covers the company itself, its workers, and you from financial burden for any accidents. Reviews and references: Any company can talk itself up, but the true test of quality and service is the reviews and references a company receives. Ask all potential window cleaning companies for any available references and check up on them. Look for reviews to see what clients feel about the company. It is also a good idea to check a company's track record with the Better Business Bureau (BBB). And don't be afraid to ask questions, both of the company about its services and employees and of others who have used that company's services.